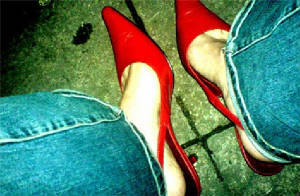 I inherited my red pointy shoes from a former housemate, and knew they'd go far.... They were worn in, but not too much, they were vintage looking without looking second-hand, and comfortable! They don't come out very often, but when they do, I get comments. For a long time, they sat unworn, and unloved in my wardrobe whilst I built up the courage to wear them. I don't know if I thought they wouldn't suit me, or if I thought they'd be useless for dancing, but I avoided them for a long time. They're now my fancy shoe of choice!